Leadership Corvallis 2018-19 participant Echo Alexzander is the 2018-19 recipient of the Scott Zimbrick Small Business Scholarship, which provides financial assistance based on need and service to the community of an existing small businessperson or independent consultant. This scholarship is given in his name to a person who will be encouraged to carry on his legacy of community service. What have you liked the most about participating in Leadership Corvallis so far? Describe your most memorable experience volunteering or serving in a leadership position in the community. “I began involvement in the Community Independent Business Alliance (CIBA) group in spring 2018 and quickly found myself taking a lead (volunteer) role in reviewing and reviving this great local group. Over the last year, I have been so encouraged by the work we have done locally in the small business community and how I have been able to serve them in a number of capacities from Buy Local First to a social media re-launch. What is one surprising thing about you not many people know? If you could recommend one thing to incoming Leadership Corvallis participants, what would that be? Echo Alexzander is an entrepreneur and small-business owner in Corvallis. 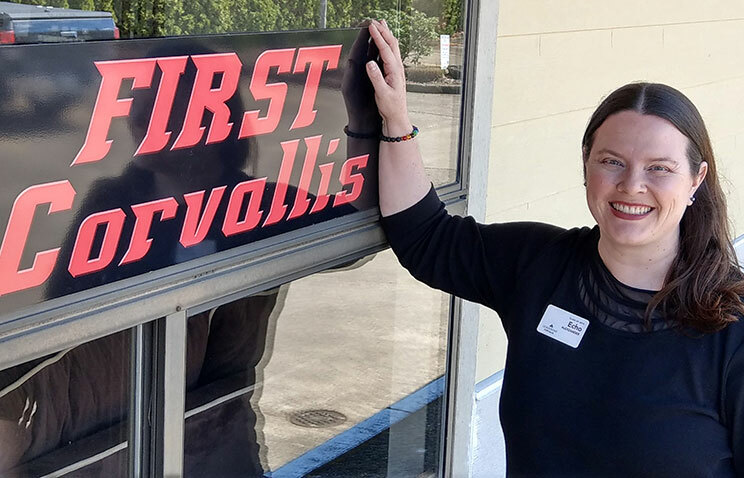 She and her husband James own and operate FIRST Corvallis, a local business that is ‘The PREMIER Wellness Center in Corvallis.’ They have been growing and serving the Corvallis and surrounding communities for eight years this December. In prior careers, Echo has worked in health care IT and project management, and traveled all over the U.S. as a senior consultant. Working with companies including the Mayo Clinic, Stanford Children’s Health, Trinity Health, Deloitte and The Advisory Board Company, she has been a part of best practice health care and process improvement in a number of ways. She now is building a Young Living Essential Oils network marketing business full time with her tribe. Combining her knowledge of wellness, empowerment of others and love of saving people money, this has been an exciting transition over the last year and perfect fit for her. Echo has bachelor degrees in health care administration and business administration and graduated as an NCAA collegiate athlete throwing the javelin on the track team. In Corvallis, Echo is an active member of the community through many business, civic and volunteer organizations, including the Community Independent Business Alliance (CIBA), Corvallis NBG, Red Cross, Stone Soup Kitchen, Love Inc., CARDV, Furniture Share and many more. With a heart to teach and serve, she loves being an active part of positive change.